Risotto is a traditional Italian rice dish made from a short-grained, starchy variety of rice called arborio rice. The technique for making it is called the risotto method, which involves stirring small amounts of hot stock or broth into the rice a little at a time, allowing the liquid to be absorbed as you go. While the rice cooks, it releases its starch, which is essential to giving the risotto a rich, creamy consistency. The more starch in your rice, the creamier the risotto. 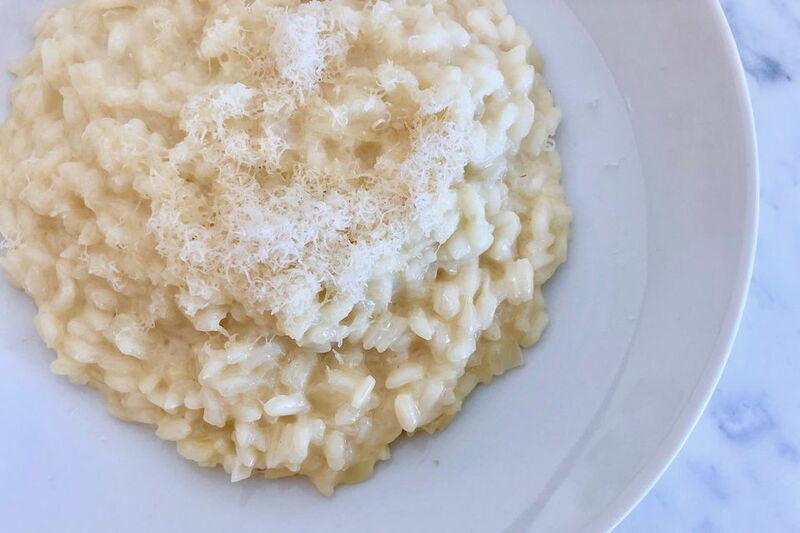 This is why cooking your rice slowly is essential; cooking risotto low and slow gives super-starchy arborio rice the time it needs to release the starch and achieve the sought-after creaminess. Like pasta, risotto is cooked al dente, which means that it should be slightly firm to the bite—a degree of doneness that might seem underdone in ordinary white rice. It should not be crunchy though. For each cup of uncooked rice, you will need about 4 cups of hot chicken stock. Keep the stock hot in a small saucepan at a low simmer over a separate burner. You will also need a small ladle that holds 6 ounces or so for adding the hot stock. Use a wooden spoon for stirring the risotto—it is less likely to break the grains of rice than a metal spoon. 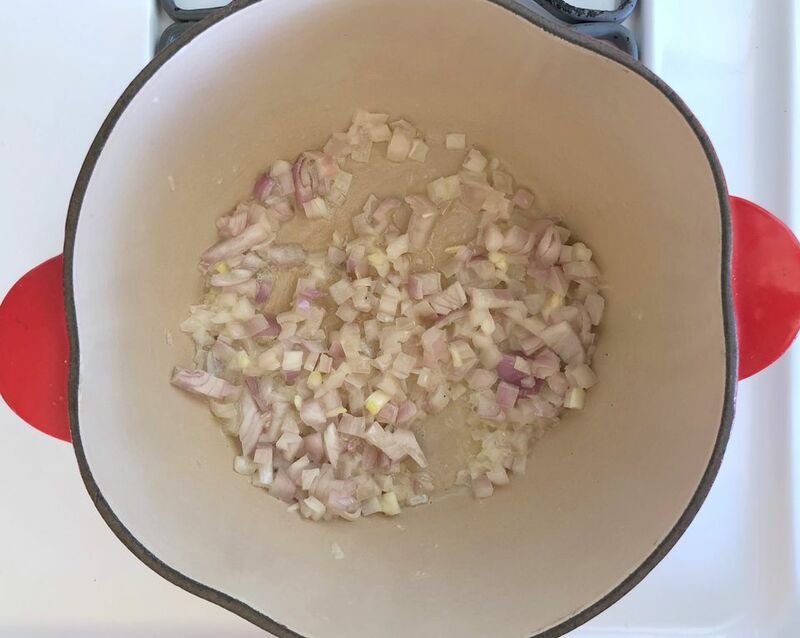 The first step is to heat 1 tablespoon of unsalted butter and 1 tablespoon of vegetable or olive oil in a heavy-bottomed saucepan or a straight-sided sauté pan, then add about half a cup of finely chopped onion. Cook on medium-low until the onion is translucent. Add 1 cup of uncooked arborio rice and stir briskly, coating the rice grains with the hot butter and oil. Sauté the rice for a minute or two until there is a slightly nutty aroma. The rice should not look brown or toasted though. Add a 1/2 cup of dry white wine to the rice, and stir until it is fully absorbed. Take your time; it needs to be fully absorbed. The wine livens up the flavors of the risotto. Any decent dry white table wine will do. If you have some dry white vermouth handy, that would be a good choice. Add a ladle of hot chicken stock from the pot of stock that you are keeping hot on a separate burner on the stovetop. Stir it until the liquid, once again, is absorbed. When the rice appears almost dry, add another ladle of stock and repeat the stirring. It is important to stir constantly, especially as the liquid gets absorbed. This prevents scorching. Add the second ladle of stock as soon as the rice is almost dry. Continue adding more ladles of hot stock and stirring the rice while the liquid gets absorbed. You will see your risotto take on a creamy consistency as the rice cooks and begins to release its plentiful natural starches. The total cooking time will be about 20 to 30 minutes. The risotto is done when it is al dente but should not be crunchy. Stir in another 2 tablespoons of unsalted butter and about 1/4 cup of freshly grated Parmesan. You can also stir in some finely chopped Italian parsley. Adjust the seasoning with kosher salt. Risotto turns sticky and gluey if it left too long in the pan or fridge, so it should be served immediately. A properly cooked risotto should form a soft, creamy mound on a dinner plate. Rice and this recipe for risotto are gluten-free. Because rice is gluten-free, those with celiac disease tend to eat a lot of it. Some scientific experts warn not to go overboard with rice because rice also contains naturally occurring arsenic, a known carcinogen. Eating rice dishes like risotto as part of a well-balanced diet with other gluten-free grains is fine, but too much may increase your ingestion of potentially cancer-causing substances.